Hello and welcome to She Reads Novels. My name is Helen and I’m a book lover from the North East of England. The title of my blog is inspired by a line from Mary Elizabeth Braddon’s 1864 classic The Doctor’s Wife – “She had read novels while other people perused the Sunday papers”. This isn’t completely true, as I do sometimes read the Sunday papers – but I have to admit I would rather be reading a novel! I particularly enjoy discovering 19th century classics and immersing myself in long historical fiction novels, but I do read other genres too. To give you an idea of the sort of books I like, some of my favourite authors are: Daphne du Maurier, Dorothy Dunnett, Alexandre Dumas, Rafael Sabatini, Sharon Penman, Georgette Heyer, Wilkie Collins, Agatha Christie, Anthony Trollope, Thomas Hardy, the Brontës, Guy Gavriel Kay and Mary Stewart. This blog is a place for me to post reviews of all the books I read and to share my thoughts on reading in general. 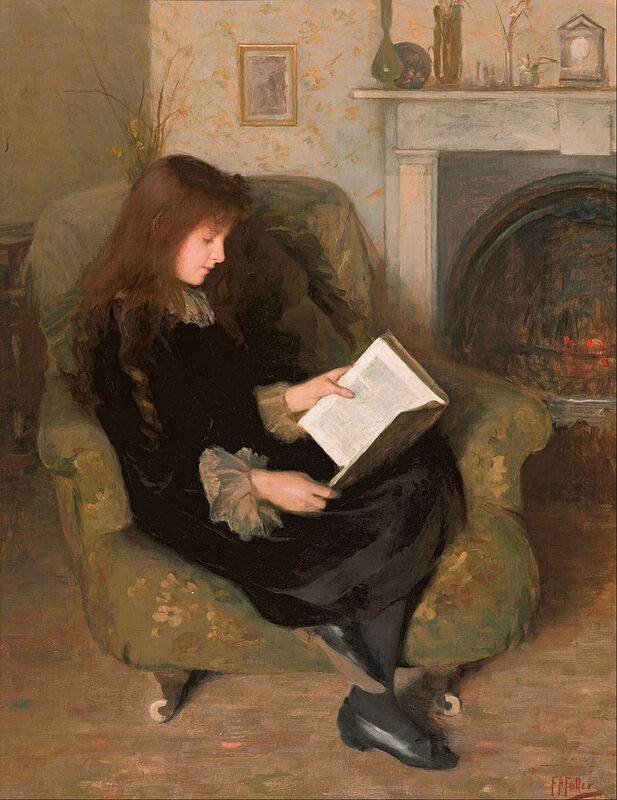 The picture I am currently using for my WordPress avatar (the image you’ll see beside my name when I reply to comments) is Inseparables, a painting by Australian artist Florence Fuller. I came onto your site looking for ghost novel reviews (since that’s what I’m doing as well as writing), but I see a lot more here. Turns out, you read many of the same books I do, and you have already read books on my to-read list. I look forward to perusing your site! Hey there! I’ve nominated you for the Very Inspiring Blogger Award! I hope that you do not mind but I have nominated you for the Shine On award. Take a look at what its all about. hi!!!!! I also luve to explore in the novels…I just love to create an reading aura beside me….I like ur blog….plz update some good novels to read as I’m new to blogging….. I found my way here through bookbridgr. It’s always nice to find a fellow Brit’s blog to follow! Nice to meet you, Sarah Clare! Thanks for following. I have literally been scrolling through your reviews for the past hour. I really like your taste in historical fiction and historical fantasy. I have now added Guy Gavriel Kay, Ursula K Le Guin, and Dorothy Dunnett to my authors to read list. I thought I had read everything Eva Ibbotson wrote, but clearly she wrote adult works I haven’t read yet. You certainly have a fabulous blog. Hi Fariba, thanks for your kind comment – I’m glad you like my blog and have found some new authors and books to add to your list! Hey Helen, nice blog. I work at Record and we’re currently looking for freelancers. I think you’d be a nice addition to our roster.